Professor Marcia Langton's 2012 Boyer Lectures discuss the dependency of Aboriginal businesses and not-for-profit corporations on the resources industry and their resultant vulnerability to economic downturns. 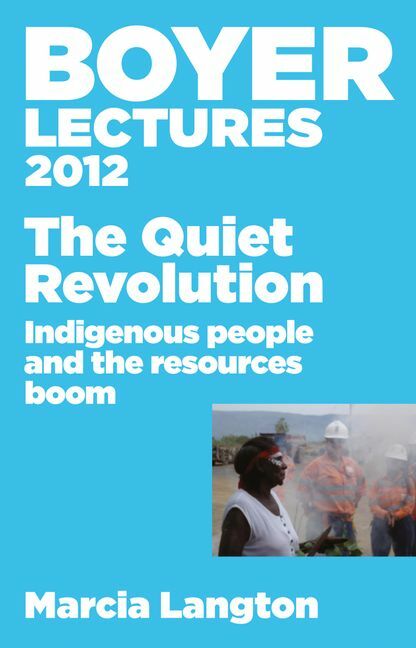 'My aim with the 53rd Boyer Lectures has been to inject new ideas and new ways of thinking about the status of Indigenous people in Australia and about the impact of the mining boom in the Aboriginal domain. My hope is that my interpretation of the economic impacts of the mining boom and some facts about our economic history are introduced into the national conversation about Aboriginal people, and thereby encourage a more sophisticated view than the archetypal one of the native as perpetual victim with no hope.' When W.E.H. Stanner delivered the Boyer Lectures in 1968, 'After the Dreaming: Black And White Australians - An Anthropologist′s View', he gave credence, perhaps inadvertently, to the widely held assumption at that time that Aboriginal life was incommensurate with modern economic life. today, the expectation is quite the reverse. the emergence of an Aboriginal middle class in Australia in the last two to three decades has gone largely unnoticed. there are hundreds of Aboriginal businesses and Aboriginal not-for-profit corporations with income streams, delivering economic outcomes to communities on an unprecedented scale. the 53rd Boyer Lectures, presented by Professor Marcia Langton AM, is an investigation into the dependency of Aboriginal businesses and not-for-profit corporations on the resources industry, and their resultant vulnerability to economic downturns. Professor Marcia Langton AM, is the Chair of Australian Indigenous Studies at the University of Melbourne. An anthropologist and geographer, she has researched Indigenous relationships with place, land tenure and environmental management, agreement-making and treaties in the Northern Territory and Cape York Peninsula.